ARC is the ensemble-in-residence of Canada’s Royal Conservatory of Music; its members are all soloists and chamber musicians and senior faculty members of the Glenn Gould School, the Conservatory’s professional training division. Since its creation in 2002, ARC has presented a number of highly successful concert series and symposia in Toronto, including explorations of music of the Holocaust – Music Reborn; programmes of British chamber music from the early 20th century, and a series devoted to chamber music by film composers – Reel Music. These projects have all been broadcast by the Canadian Broadcasting Corporation and by National Public Radio, throughout North America. ARC’s programmes are exploratory, thematic and instrumentally diverse. The ensemble collaborates with guest artists as well as outstanding GGS students, and while its mandate includes the performance of the traditional chamber music canon, its focus is on repertoire that, through political changes or shifts in musical fashion, has been ignored. ARC also fosters the creation of new compositions and develops creative associations with musicians outside the Western classical tradition, as well as artists from other disciplines. 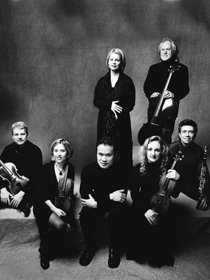 ARC made its New York debut in 2003, performed in Sweden and the U.K. in November, 2004, and toured China in the Spring of 2006. Its first recording, On the Threshold of Hope (RCA Red Seal), dedicated to the music of Mieczysl/aw Weinberg, was nominated for a Grammy Award in 2007. It was followed by Right Through the Bone – Chamber Music of Julius Röntgen, which garnered equally enthusiastic reviews. ARC’s internationally successful Music in Exile project, a series of concerts and lectures devoted to reclaiming music of émigré composers of the 1930s, has now been presented in Toronto, Rome, London and Budapest. The series will be brought to Israel for the 2009 – 2010 season which further concerts in the US and Europe. ARC’s artistic director is the guitarist Simon Wynberg.